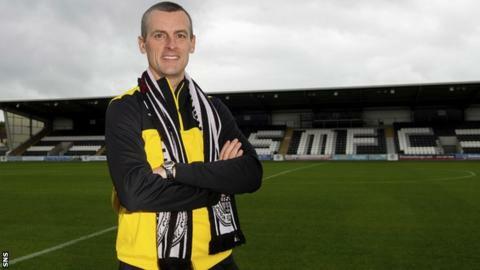 Oran Kearney says he was not deterred from taking the St Mirren job by the club's recent turnover of managers. The Northern Irishman, 40, is St Mirren's seventh permanent manager since Danny Lennon left the club in 2014. Kearney is moving into full-time management, having combined his part-time role at Coleraine with teaching. "With my recollection, the new board have only been in place for one or two of those managers," Kearney said. "It would be unfair to speak about old regimes. "It's not scary, it's exciting. You have to see it as a challenge and something that I do feel I'm ready for." Alan Stubbs replaced Jack Ross, who joined Sunderland, at the Paisley club in June. Kearney had been interviewed for the job before Stubbs was appointed and, after the Englishman left the role a week ago, chief executive Tony Fitzpatrick and chairman Gordon Scott met with Kearney in Northern Ireland last week. St Mirren will appoint a technical director to work with Kearney. "Jack obviously left for reasons nothing to do with the board," Kearney explained. "I think, if the board had their way, I wouldn't be standing here now and it's fair to say that. "I've had a great nearly eight years at Coleraine, I've been 16 years in school as well. "I feel the 16 years in school will serve me as good as the eight years in football with Coleraine because the skills that are needed to deal with people and build relationships are so important. "I think it's so important that I have somebody who knows the league and understands the league. "For the first while, [the technical director is] going to be so helpful to me. They're going to be my eyes and ears." Kearney was quoted on Sunday as saying he wanted "to win the league" in his new job. "If you watch the interview back and you actually listen to the question, the question is, 'what would you like to achieve with St Mirren? '," he told BBC Scotland. "And my answer was like it would be for Coleraine at eight years, and at any club that I've ever been to, my aspiration at the start of every season is win a league or to win a cup because I think you have to reach for the stars in anything that you do. "If the question was, 'can you win the league with St Mirren this season? ', I think the answer would've probably been different. "You have to set your aspirations high. At Coleraine, in my very first year, I wanted to win cups and leagues and it took us seven years to do that, but we won a cup and we got there. "If you don't set your standards high and, if you don't reach for the stars, I don't think you'll ever reach them."